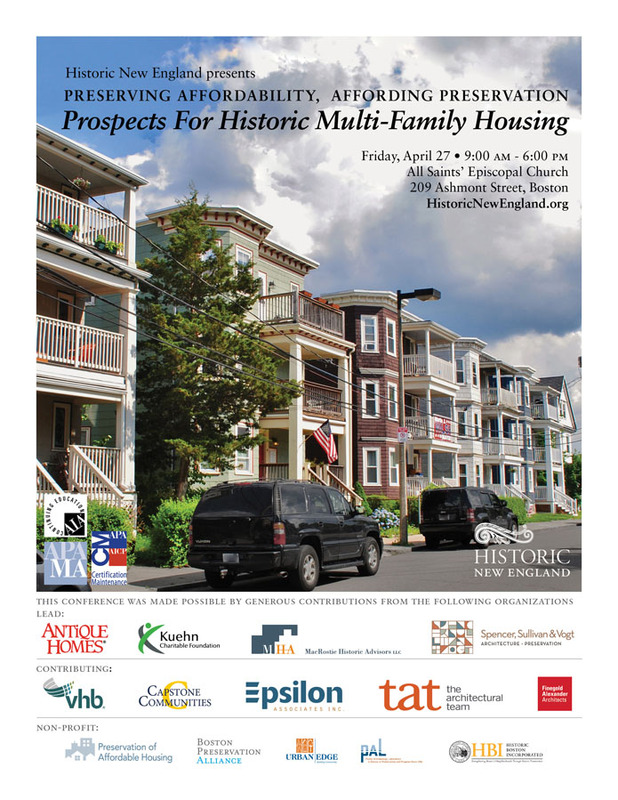 Historic New England presents Preserving Affordability, Affording Preservation: Prospects for Historic Multi-Family Housing on Friday, April 27, 2018, at the All Saints’ Church in Boston. The conference gathers leading advocates in affordable housing and historic preservation to look at the past, present, and future of our region’s historic multi-family housing. Historic multi-family buildings, such as New England’s iconic three-deckers, once served as “gateway” housing, providing affordable options for renters and a path to home ownership. Can these historically affordable buildings be adapted to meet current needs? Can we preserve affordability while also preserving historic buildings, neighborhood character, and urban density? Presentations include scholars and practitioners in urban planning, historic preservation, architecture, and politics. The conference explores how cities can approach preserving historic character while balancing sustainability, affordability, and diversity. Join us for this conversation that brings together voices from historic preservation and affordable housing to consider historic multi-family housing and its place in our communities. See a complete list of speakers and an agenda. Register online or by calling 617-994-6678. The registration fee is $85 for adults and $35 for students with ID. Fees include a continental breakfast, lunch, and reception.